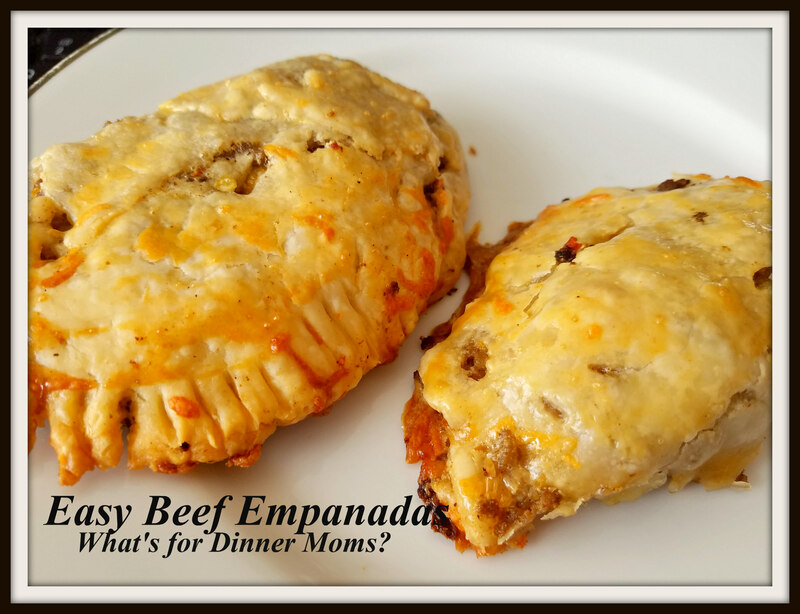 Easy Beef Empanadas – What's for Dinner Moms? It isn’t the first day after the Daylight Savings Time, spring ahead, that takes its toll on our bodies Sunday is fine for us. It is the following Monday and Tuesday. Dragging ourselves out of bed an hour earlier is so tiring by evening and we are all bleary eyed in the morning. My son ate breakfast and went upstairs to get dressed for school yesterday and actually crawled back into bed and fell asleep. He didn’t even remember doing it! So, we need super easy meals to keep us going this week with plenty of shortcuts. These were my first attempt at Empanadas. It was super easy because I use pie crust as the crust rather than making my own dough. Notice I said, EASY not authentic. I learned to not let the dough sit out too long so that it gets mushy AND to let the filling cool before trying to stuff the empanadas. Other than that I think these really were so easy I am ready to try them again and maybe take on making my own dough soon! These were a super easy version of Empanadas to make during the week. I wanted a dish I could have ready with out too much rolling, cutting, etc… So, when I read an article that suggested using pie crusts instead of dough I had to give it a try. These tasted good! They definitely were not real empanada but they had enough of the flavors to make us happy. I do want to try making the real thing but I think that is going to be a weekend project. Preheat oven to 375 degrees. Line a large rimmed baking sheet with parchment paper. Can also use two baking sheets. Combine bell pepper, onion, olive oil, and garlic in a skillet over medium heat for about 3-4 minutes. Add hamburger to the pan and cook until meat is no longer pink. Drain any grease from the pan and add cumin, chili powder, water, and red pepper flakes to the meat. Stir well and taste. Adjust spices to your liking. Continue to heat meat until water has evaporated and all liquid is absorbed. While meat mixture is cooling, roll out pie crust until it is flat. Place meat mixture in the center of each pie disc. Gently place Empanadas on a cookie sheet. Brush on to tops of each empanada with egg. I love empanada ! I make empanada all the time, but the filling is different, Filipino style. Ground chicken is preferred, instead of beef. ( Beef is never used in Filipino empanada ). Basic ingredients are ground chicken, raisins, potato, green peas, carrots. Ooo, that sounds delicious. I will need to look those up. Thank you. Mmmmm, I love empanadas! Great shortcut! When I have time, I like to make extra pie crust (home made) and freeze it. This would be a great use for it! Super idea! I rarely make pie crusts but may have to give that a try. These are definitely a simplified version of Emapanadas but my family liked them! Love easy meals like this !!! Thanks for the recipes. it seems easy enough to make it. My first time eating Empanada was in Gallapagos and it was delicious but I could not find in Europe unfortunately. This is definitely an empanada knock off but is super simple to make.